I had turned four years old four months before the above photo was taken in our front driveway. 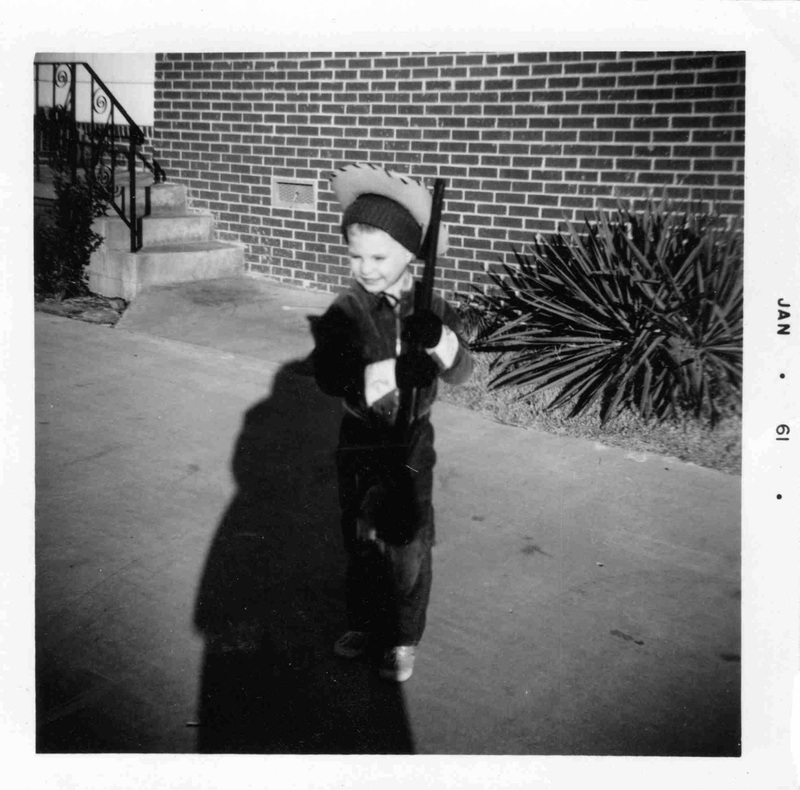 I must have been cold, to wear a stocking cap underneath my cowboy hat! I don't recall the long gun, but it looks like one of the typical air-pump rifles of the time. You ratcheted the trigger guard away from the stock and back to "wind it up" so that when you pulled the trigger you got a satisfying "pop!" sound. Note I also have some "cowboy gloves" with gauntlets. And that's my mom's shadow falling across my figure. I was facing due west, so this must have been taken in late afternoon, with the sun sinking behind her. 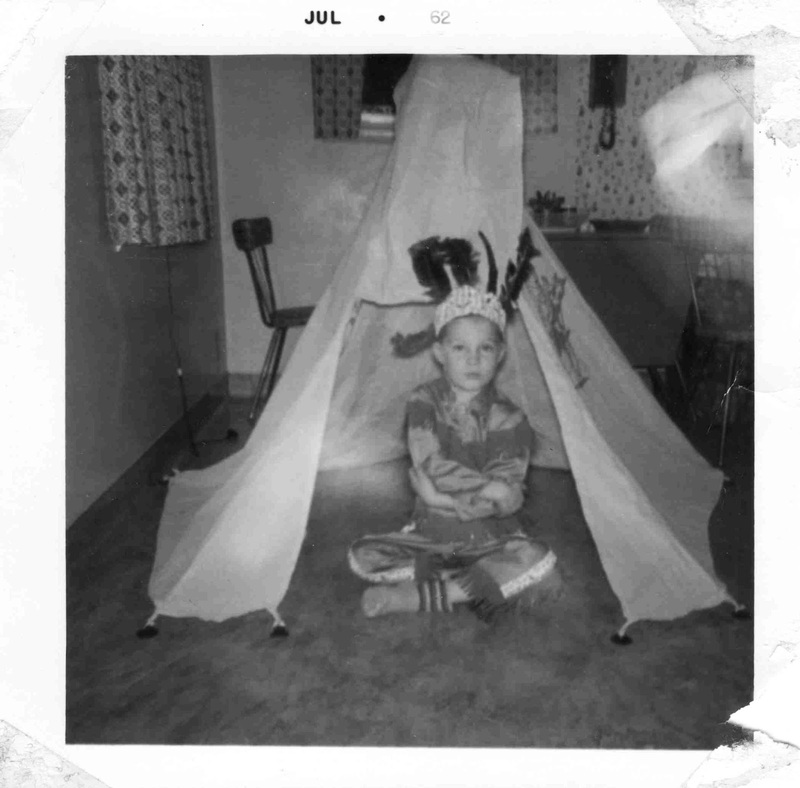 Now, something I DO REMEMBER is my Indian teepee. Pretty cool, huh? The date on this print is July 1962, six months later than the previous shot. I must have seen this tent outfit in Otasco or at Montgomery Ward's. It's pretty neat, especially since Mom has allowed me to take up about half the kitchen floor to set it up. (Those suction cups wouldn't stick to the wood floors in the rest of the house, but they worked fine on kitchen linoleum.) I still have ONE of those suction cups kicking around. Note the "buckskin" outfit, complete with fringes on the sleeves and pant legs. A couple of the feathers in the headdress are a little askew -- maybe I wore the thing during nap time too! I'm thankful for the wonders of imagination and parts-playing that my 1960s childhood included. Most of the time when we played "Cowboys and Indians" or "Silver War" -- we didn't know the words OR THE CONCEPT of "Civil" War -- it was just as honorable to be one side as the other. It was PLAY, for heaven's sake, not "an evil societal evocation of a shameful blot on the past." It was fun, dressing up and playing around the neighborhood, part of a childhood that had the best parents ever! I pray that your own childhood has happy and thankful memories. If not, then find some kids in your church or neighborhood and try to help them have fun! Volunteer someplace, or just wave at the kids as they zip by on bikes or skateboard. Be part of somebody else's happy childhood.